"A gripping white-collar crime thriller that, in its scope and human drama, ranks with some of the best investigative business books of the past 30 years." "If you love soccer, then you probably hate FIFA. I took immense pleasure in reading this cracking tale of how an unlikely crew of Yanks busted the cabal of crooks that ran the global game for so long. Ken Bensinger has beautifully reported a great procedural that gets to the heart of so much that is wrong with sport—and the world." 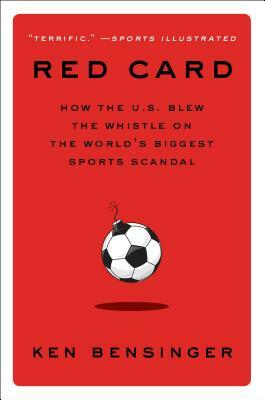 "Red Card is the meeting of American investigative reporting and real-life cop show." "Take one of the biggest scandals in sports history—the FIFA soccer case—and put it in the hands of a skilled reporter and writer, and you have a riveting book like Red Card. Author Ken Bensinger delivers a suspenseful, highly entertaining story told with novelistic detail, deep insight and the pace of a thriller. Anyone wanting to know how international soccer fell into a colossal swamp of corruption will find all the answers here." "Gripping. . . . Bensinger’s impeccably sourced account serves as a sharp reminder of the gargantuan levels of largesse and excess during FIFA's bad, bad days."